Fair Trade Rattles: Vander is just at the age where he can enjoy a rattle, even though his little fingers can’t quite grasp it without help. He loves looking at them and smiles as they ring. These fair trade Pebbles rattles (hello, an avocado rattle! A must-have) are my absolute favorite. I’m planning on gifting him the apple one for Christmas. La Colombe Cold Brew Coffee: Now that I’m not pregnant any more, I can’t get enough coffee. Sleeping only 4-5 hours a day means that I’m relying on at least 8 ounces of caffeine a day to get through. These cold brew coffees are so delicious, the chai draft latte and coconut milk mocha latte are my favorite. Vero Pizza and Pasta: If you ask me what my favorite restaurant in St. Louis is, Katie’s Pizza and Pasta tops that list. Homemade, creative pasta, salads and the best pizza are the reason I’m dining there at least monthly. So, when I heard they were now offering a meal subscription service, I couldn’t wait to try it out. 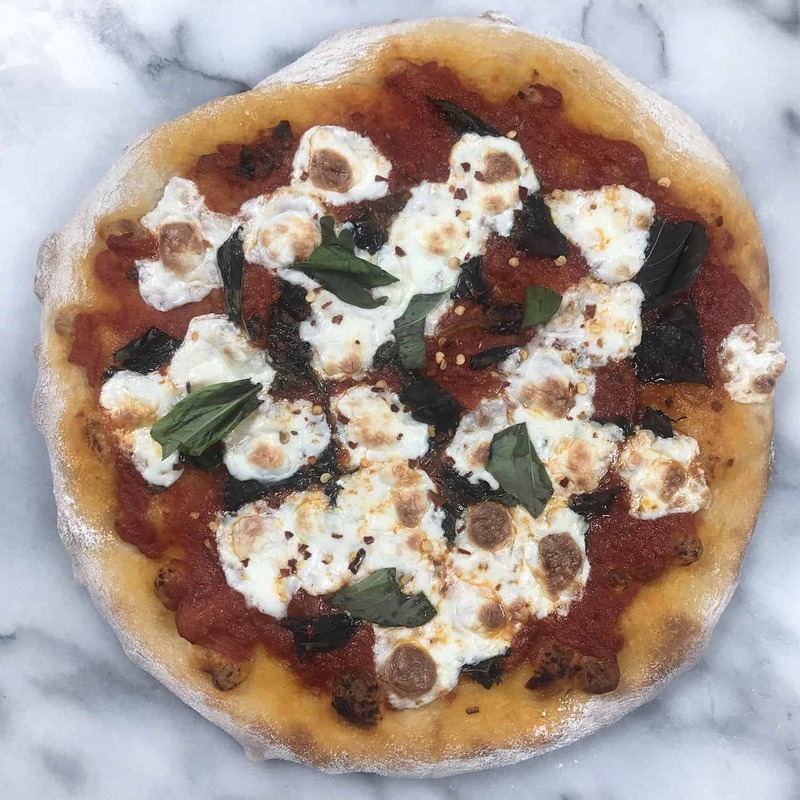 We tried the margherita pizza and arrabbiata sauce last month and it’s just as good as the restaurant. As an Italian-American who wrote an entire cookbook dedicated to pasta, trust me when I say that these recipes are incredible. If you are in the St. Louis area (they are working to expand nation wide- check and see if your city is listed), then you’ve gotta try this out. Thrive Market: I’ve written about my love for Thrive market previously but I’m an even bigger fan now that trips to the grocery store are few and far between. I love the concept: organic and natural food as a discount. For a small subscription, I appreciate that I can get the brands (and values) that I love at a reduced cost. Plus, free shipping. Their house-branded items are great, we’ve been loving their beans, peanut butter and roasted nuts. Generations of Love and Food: My good friend Meme recently released this cookbook and ya’ll, it’s a good one. The concept speaks to my heart: a cookbook she created with her grandmother. As someone who misses my own Mormor all the time, this project warms my heart and I love being able to support it. While it’s not all vegetarian, there are some fantastic recipes that I think you will love– like boiled peanuts, a staple snack growing up in Virginia that I haven’t had in almost a decade, and leek and mushroom pasta. These recipes are focused on plants and high quality ingredients, and include a photo with every recipe. Check it out! Alternative Vegan: Marie cooks like I cook– mostly plant-based with a little egg and cheese thrown in. While the title is a little misleading (it’s not a strictly vegan cookbook), the premise is there: mostly vegan recipes with the option of adding in eggs, dairy and fish for those that want it. If you have a divided household, this is a great cookbook with recipes to please everyone. I made her juicy baked apples with coconut cream last week and they were delicious! Women Aren’t Ruining Food: An interesting read on food trends and the double standard that comes for women vs. men. While I still prefer my sauvignon blanc to rose, I’ll always love avocado toast, cupcakes and macarons. The Goddess Myth: All moms need to read this. Actually– everyone could benefit from this read. I’ll share in a later post our breastfeeding journey, but it’s been less than ideal to say the least. And, the mom guilt that’s come from that has been overwhelming. Why? This article is a beautiful reminder that motherhood is hard to get wrong. A Holiday Survival Guide for Sad People: I’m aware that while this time of the year seems oh-so-bright for my family right now, that’s not a universal truth. To my friends whom the holiday season doesn’t feel joyous and bright, my heart goes out to you. And, if you’re struggling with how to acknowledge that, this post is a good read. The Dietitian Divide: For my fellow RDs/RDNs. There’s a big divide between nutrition professionals, mostly around the idea of functional nutrition and GMOs. I know I’ve faced backlash for offering food sensitivity testing (the results don’t lie), and it’s good to see this discussion come to light. It’s also a larger discussion on how social media breeds trolls, no matter the topic. Instant Pot Pumpkin Walnut Chili: I loved this chili, a recipe that I made with my mom when she was in town last month. It’s a bit different, but the texture of the walnuts felt perfect in this hearty chili. And, of course, it’s made in the Instant Pot. Black Bean Sweet Potato Enchiladas: Two of my favorite foods in one. These enchiladas were meaty, hearty and perfectly spiced. Cranberry Swirl Muffins: Obviously I love cranberry muffins, I shared my own version yesterday. These are a little more indulgent and just as delicious. I’ve watched more TV in the last two months that I probably have all year. Here are the series I can’t get enough of. Manhunt: Unabomber: Wow, this drama is so, so good! A look at how the Unabomber was caught by unraveling his his 35,000 word manifesto. Law & Order: True Crime: I was a little babe when the Menendez brothers went to trial, so I only vaguely remember the case. If you like true crime like I do, you’ll love this series with a fantastic cast. The Americans: I just started this series a few days ago, but I already love it. Plus, Keri Russel. I’ll always have a soft spot in my heart for Felicity. It’s no secret that I love podcasts; these are the episodes that I highly recommend. How to Eradicate Heart Disease: A great listen (and reminder) of the power of a plant-based diet when it comes to heart health. Lessons from world’s happiest people: I’ve listened to this one twice and think it’s a must-listen for everyone. I appreciate his perspective that the overall environment is more important than personal motivation. Note to self: always live with a sidewalk in front of your home, socialize more and work less. BL- can we move to Santa Barbara or Copenhagen? Super Soul Sunday: Everything Oprah touches I love, this podcast included. I really enjoyed the conversation with former VP Joe Biden (get the tissues ready) as well as her talks with Brene Brown, Elizabeth Gilbert and Shonda Rimes. Ever since I saw this post, I’ve been pestering my (Italian) husband to check out Katie’s. We finally went and it was amazing! It’s only been 3 days, but I am counting the minutes until I can eat more lemon strozzapreti. Thank you for the fantastic suggestion! YES! So glad you tried it. It’s amazing!